Death Star – 30 Merkins at each designated point, set in shape of star, 300 in total. Prayers were lifted up for Phat-Pat’s church family, and Spellchecks coworkers dad. Time is precious. Everyone has the same number of hours in a day / week. Plan, budget and “spend it” wisely. The blue-collar dog didn’t post, but the woodpecker did. THE SCENE: This is all Phat Pat’s fault. You see, PhoaP got a “real job” where The Man holds him down on the daily. Can you believe his boss demands he be onsite at a definite time every day? This is 2019! I’m a knowledge worker. At my job, I show up when I feel like it because you can’t just make knowledge work happen at will. The mood has to be right. I need my Aeron chair, ear buds, and dual 27″ monitors. My alarm went off at 0400. I cranked up “Danger Zone” and grabbed my clothes. After some shadow boxing in the mirror in my skivvies, I got dressed, and hit the john. At 0420 (shout-out Howze Park! ), I slipped on the Brooks and headed out. Drizzle! Did not account for that. Fortunately, it never matters. By the time I arrived at tBC, the ground was sufficiently moist and the air pleasantly cool. PhoaP was nowhere to be seen, but Choker and Gilligan were waiting in their cars. I planted the state’s shovel flag and waited for the laborers. At exactly 0429, the lot filled and all ten PAX were assembled. Not a single man was late. S-L-O-W mosey to the tennis courts! PAX paired up and did Bear Crawl 1-2-3. It’s like Dora, but even better! Lining up on the sideline of one court, Partner 1 starts on the exercises while Partner 2 bear crawls to the opposite sideline and crawl bears back. Flippy floppy until each pair completed: 100 merkins, 200 big boy sit-ups, 300 squats. YHC turned to his advisor (Ganon) and asked him to pick 11s or Tammy Wynette. Ganon chose 11s. Bad choice, Ganon! 11s with Carolina Tennessee Dry Docks and V-Ups. Instead of moseying or something in between exercises (BORING! ), we just stayed put and did 10 smurf jacks (FUN!). So, 10 dry docks, 10 smurf jacks, 1 v-up, 10 smurf jacks, 9 dry docks, 10 smurf jacks, 2 v-ups, etc. We got about halfway through and YHC called it to save a couple minutes for Mary. Flutter kicks x20 IC, keep feet up, Hello Dolly x15, rest, flutter kicks x15, switch to low plank, pickle pounders x15, 30 second low plank. YHC shared Romans 12:1-2 and related the sentiment of an article I read recently about career progression. We can easily get so caught up in growth at our company that we end up being conformed to the company’s culture. Paul tells us not to be conformed to the world, but to renew our minds in Christ. Great work this morning by the PAX. The Bear Crawl 1-2-3 turned out to be more of a slog that I expected. The mumblechatter was limited. Spellcheck killed it. Check the preblast for a weekly lunch in your ‘hood. Crucible coming March 30. I stuck around a few minutes and got to catch up with Moana and Part Timer. As they left, Phat Pat put his hand of my shoulder. Looking down and away hoping I wouldn’t notice the tears, he said, “Just go, Beans. Your people need you.” Back in the car, YHC cranked “Danger Zone” back up and headed to the urine-soaked streets of Midtown. Checking Slack (at a red light, obviously), YHC’s source on the ground had not provided any location information for the Old Forest. I skidded into the lot and took the first spot available. Jumping out, I immediately started running and scanning the playground area and parking lot. Nothing. Just silence and darkness. I was preparing to start a recon mosey on the trail when a glint of orange caught my eye in the distance near the abnormally long picnic table. It was a t-shirt! As I started towards it, suddenly the whole host came into view. Arrayed around the stone table were dozens of PAX. In the middle was Four Eyes himself! I planted myself next to Dewey, who donned the orange shirt, and joined in the timer work 4E was leading. We did squat jumps, big boy sit-ups, and some burpees. Shoestring was talking about doing extra reps. I did more. Mary was a horrible circuit of hello dolly, american hammers, and groiners. 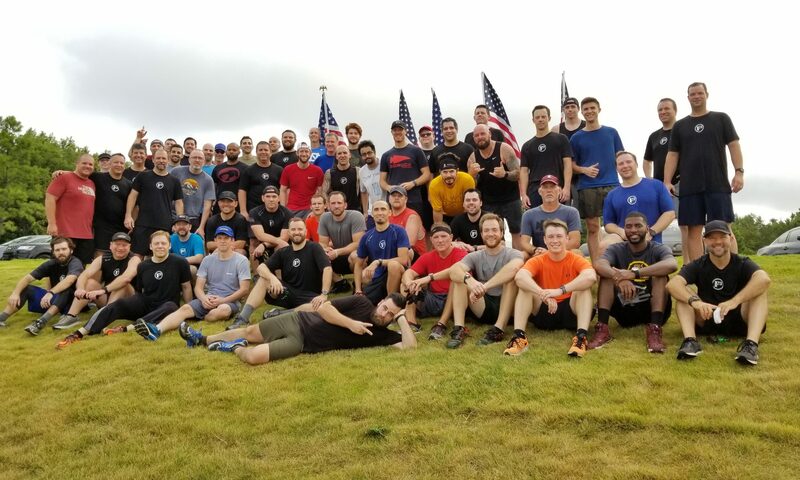 27 PAX came out to the Old Forest, but Blart and Lazarus inexplicably went to the Levee and ruined everything. There’s always next month!